Werner Herzog’s “Aguirre: The Wrath of God” begins and ends with like-minded shots – the first being that of a troupe of explorers scaling down a soaring cliff side in the Andes Mountains, and the last being that of a raft tugging steadily down a river as its inhabitants are picked off one by one from sailing arrows in the distance. Both moments are a symbol of a greater puzzle destined to unfold in brooding and hypnotic passages, yet isolated they underline a greater implication, an idea that allows viewers to observe and react on the basis of behavior and subtlety above any semblance of movie structure. This is the kind of endeavor that persists in the mind not because it implores the idea of effective payoff, but rather with the thought that payoffs are irrelevant. It seeks something deeper, something more haunting and more thought-provoking than just basic core values; it knows far more about what gets under our skin than it should. A good part of that approach stems from the vision of director Werner Herzog, who for multiple generations has been at the forefront of European cinema because he makes movies deeply saturated in themes rather than action or straightforward storytelling. “Aguirre, The Wrath of God” tells the story of man gone berserk in a nature drenched in chaos, a man who cheerfully embraces delusions of grandeur in a world too mysterious to understand, and leads countless others on an ambitious trek across dangerous terrain that will ultimately be one of astonishing failure. Herzog plays with this theory in great strokes of psychological intrigue, and his leads often stare at the camera as if hypnotized by the sullen power of the wilderness around them. To him, man and nature can only bring out the worst in each other when they meet at an intersection. The men and women of “Aguirre” seem displaced in culture. They wear lavish robes and suits of armor as if straight out of Camelot, while the Indian slaves tug along with giant carriages on their backs as if heading to court. Neither is appropriate given their situation – led by Don Pedro de Ursua (Ruy Guerra), a troupe of travelers carrying the flag of Spain have ventured into the treacherous forests of South America in search of a legend, a place spoke about in strategic whispers by overthrown Incans: El Dorado, the City of Gold. Ursua and his would-be explorers will occasionally stare off in wonder at the mere mention of their destination, so enraptured by the idea of a land filled with riches that few other things cross their mind. That is, until the natives in surrounding forests begin picking them off with arrows and poison darts. Only Don Lope de Aguirre (Kinski) seems indifferent of the impending threat of unseen faces in the forest. He belittles the slaves for their failure to cover more ground. He creates a sense of fear in the explorers who would prefer turning back from the forest’s dangers. He threatens their well-being in the face of rebellion. He has Ursua arrested for even suggesting retreat, even after a raft full of slaves caught in the river’s current becomes target practice for natives in the bushes. And in small but steady increments, Aguirre pulls himself further up the ladder of authority to arrive at a proclamation that leaves great desire in the hearts of his clueless adventurers: that of conquest, of rebellion, and of the opportunity to achieve independence from Spain by finding – and declaring ownership of – their prized golden city. It is a mass delusion on his part, of course, and one so strategically veiled that none of those who hear him speak are immediately aware of the implausibility of the venture. Like a cunning fox, he lures the troupe into an ill-fated situation that no one sees until it is far too late to reverse the course. And all the while Aguirre’s head is prominent and proud, his piercing blue eyes and stern lips grounded in conviction, always knowing that his deeply masked “wrath of god” will lead him and all of his followers to a destiny much darker than they realize. The characters who populate the movie stare blankly into the distance as if long resolved to the idea of dancing with fate. Perhaps, in part, it is because the movie is knee-deep in dread. The soundtrack thumps along with pulsating vibes and no flourishing – a fine tactic to keep the feeling constant. The screenplay does not weight the themes down with heavy dialogue or action. The actors appear in outlandish wardrobes only to contrast the unknowing stares on their faces. The cinematographer Thomas Mauch puts great emphasis on framing the picture in vibrant colors, and the camera moves only when it needs to, as if to live the slow and menacing nightmare right along with the players. That the movie is extremely slow is not a flaw but an additive to its nature as an agonizing psychological experience. It is brooding, meditative, moody yet temperate, and it exists on a plane that allows the ideas to be uninhibited. Many directors have things to say about the troubled relationship between a man and nature, yet few of them do it with this much nihilism, or with such effective minimalism as Herzog. This is because Herzog is a real filmmaker, a thinker who knows that his efforts and ideas are weighed much more greatly by, yes, experiences that can occur off camera as well. 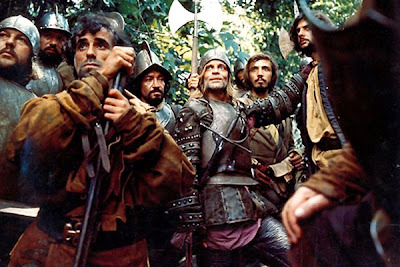 The making of “Aguirre” is almost legend in itself because of the chaos that ensued, illustrated often by historians (and Herzog himself) as a tense, difficult and often hostile set to work on. Both the director and Kinski constantly disagreed with each other on the approach of the Aguirre character and came to blows in quite dangerous ways (reportedly, Klaus threatened to walk off the set was discouraged by a gun that Werner pointed at him as a threat). The director wanted his antagonist to be subtle and beneath the surface, while the actor preferred a more frontal, tyrannical direction; in his pursuit for something less forward, Herzog would often push his star to fits of rage over script changes and refusals to compromise, finally turning on the cameras towards the end of such outbursts so that the actor was still visibly angered but on a downward slope of a enraged paroxysm. It was an approach that served both men well when they made more movies together in the coming decade, and though their greatest work together is “Fitzcarraldo,” about a man obsessed with dragging a steamship across land to a neighboring river system, it is perhaps not nearly as volatile. 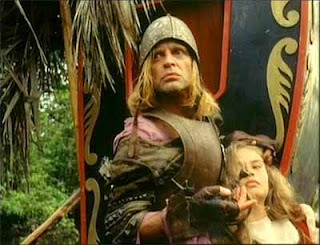 “Aguirre, The Wrath of God” leaves you feeling as if you are watching a documentary rather than a fictionalized drama. In some ways, what you are seeing is nothing short of the absolute truth. What is to be said of the movie nearly 40 years after its filming? To these eyes, and from the perspective of those who have held it in high esteem for that long, it does not lose its nerve after repeat viewings. To the contrary, it gains momentum, especially in a time when even the most idea-fueled films out of both Hollywood and the independent filmmakers are glossed over with modern complexities. Its beauty lies in the uncultivated nature of the directing, of the acting, and of the writing; here we are dealing with artists near the beginning of perfecting their craft, and in their pursuit of such a prospect they endure all the hell and misery that the true artists tend to do in order to say something meaningful. What is said in “Aguirre” reflects the nature of the film’s own creation – those who expect to arrive at destiny without sacrifice are never truly taking the full risk, and in the end only the strongest (or perhaps, the most brazen) are left standing.